When you’ve been living in a place for a year plus, some of the details that you found unbearable at first seem “not so bad” after awhile. I definitely experienced this (hello, 100-year-old rusty bathroom heater!) That’s how I felt about this corner of my living room. To be fair, the before picture is from the previous tenants. But I think some of my recent updates have transformed this nook into a happier little enclave. 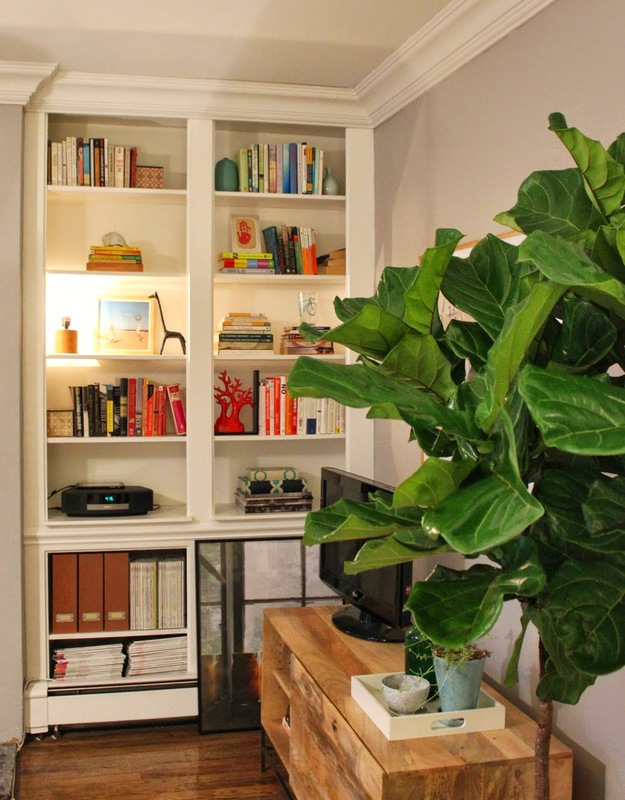 This area had some nice things going for it: built-ins on the north wall to the left, a nice cool gray wall color (Natural Grey by Behr), but based on pure apartment functionality, it was overcome by wires and power chords, not to mention my smallish (aka “man poison”) TV. And for the past year I’d been using this Pottery Barn apothecary coffee table (below) as a console. It’s a gem my sister passed along 9 years ago when she departed the city for the burbs. It packs a punch and has served me well over the years, storing everything from a collection of clutches, iPod chargers, playing cards, old passports, and nail polish (you sensing a slice of my extra-curriculars?) And I sadly have to let it go. 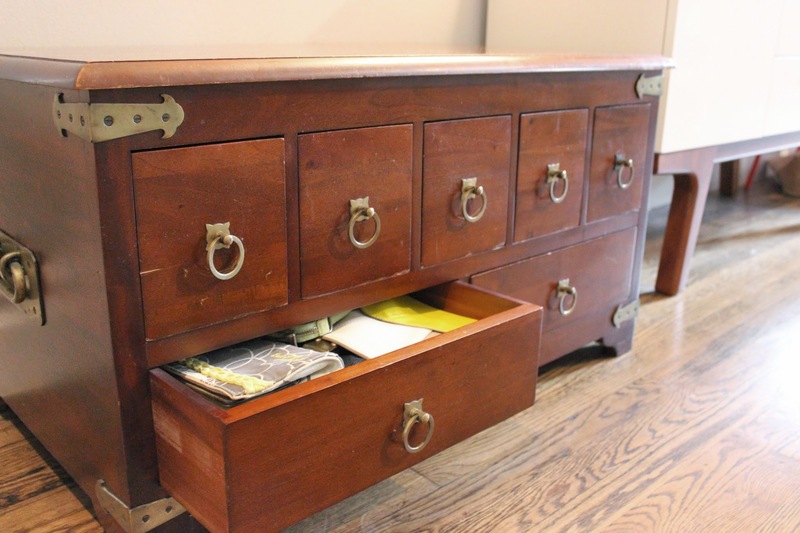 I’ve swapped it out for this West Elm console. Predictable? Yes. But there’s a certain originality to this piece: the shape is industrial but not cold, warmed up by the varying tones of wood. I also needed to fire up the walls. I had purchased this Gray Malin photo a few months ago and just had it framed. 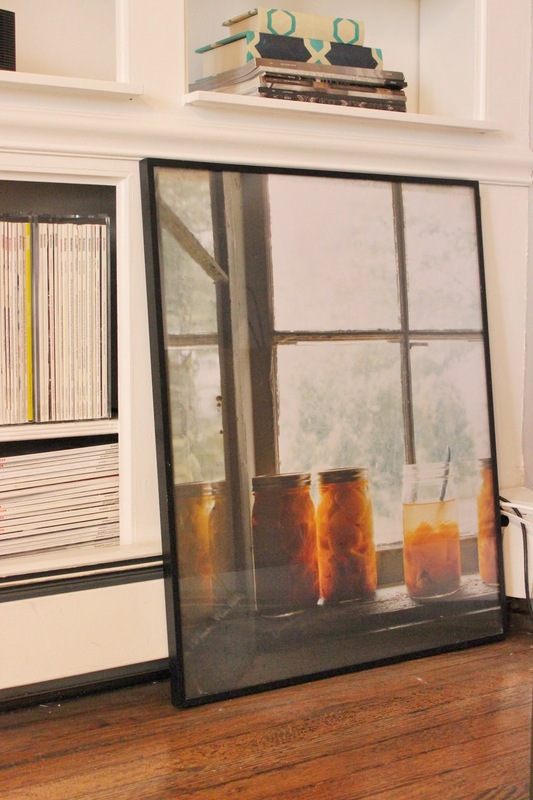 I worked with the guys at Make a Frame in Cobble Hill. They did an awesome job, and helped me choose a light maple frame and bright white matte. And while I had to remove my death grip on my wallet to pay for it, it was worth it. 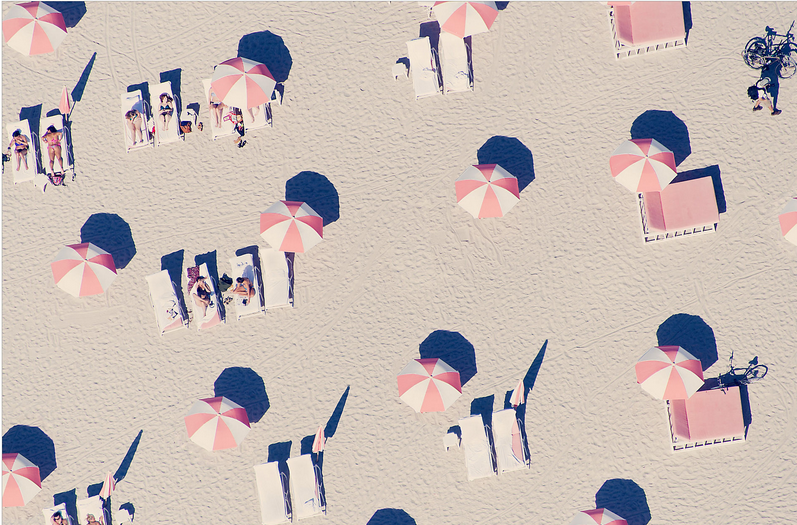 The photo itself speaks to my love of symmetry: the umbrellas strike a nice repetition, and the pinks liven up the living room, so much so that I felt the need to add a pink-striped sarong (really!) from Anthropologie as a stand-in throw blanket on the gray chair. Lesson here: even clothing can be an accessory given the right context. Some other upgrades: adding a tree. 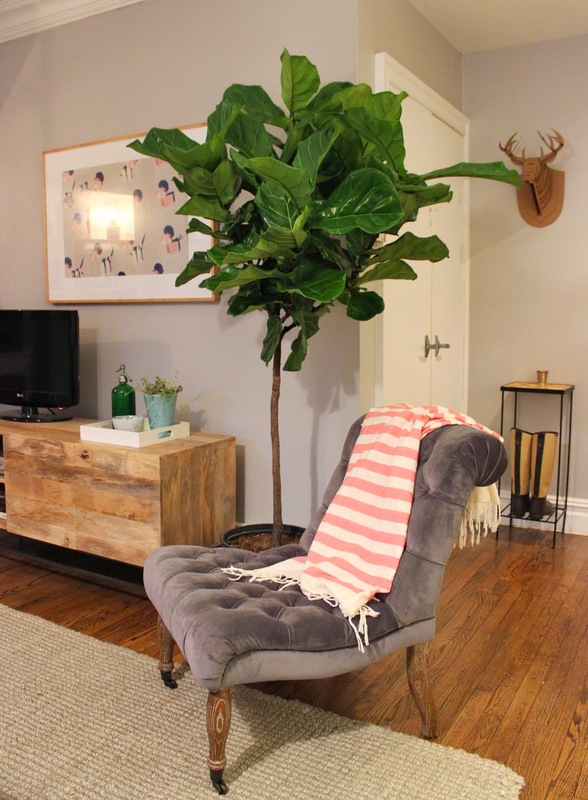 I chose a fiddle leaf fig with big, glossy leaves, in an effort to bring the eye up and take advantage of some of the apartment’s vertical space. I’d really love to keep this one alive. (Apparently you need to “dust” your plants and give the leaves regular care, just as important as watering. Who knew). I also found a solution for those unruly wires. This framed blow-up poster from a page out of Gourmet magazine makes a great shield that covers the mess, and it’s lightweight enough to be moved around when needed. Some light accessorizing rounded out the project. 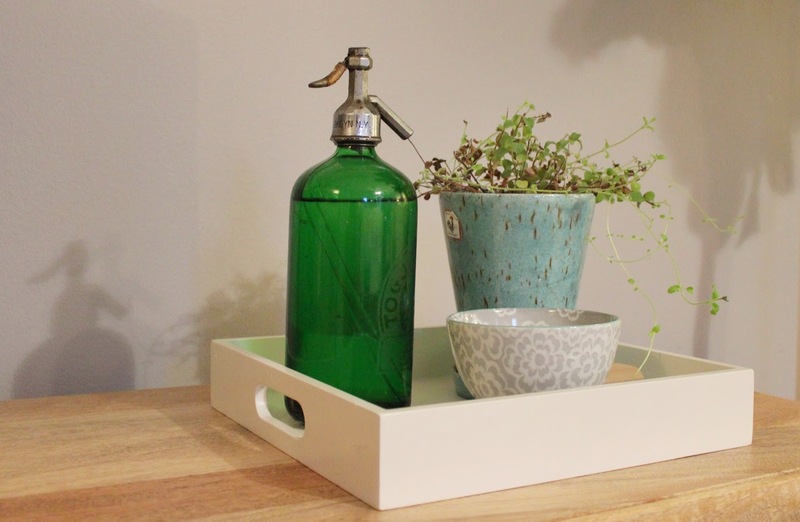 The console needed color, so I pulled in a potted oregano plant and a green seltzer bottle to pick up the shiny tree leaves, fitting them snugly in a simple white tray. Some trivia: the bottle was $18 at my local Housing Works thrift shop, presumably on sale since it’s chipped on the bottom. #nobigwhoop Score! I’m happy with the nook. It’s a treat for the eyes, and my changes added some nice storage too. As for the man poison? I think my TV will remain a humble 26″. I’m still looking for this guy, if you know where I can find him…. The tree adds a really nice touch, love it.